Her research is focused on understanding the interactions between molecules in cell membranes, the gate-keepers of life. Cell membranes are everywhere and are essential to sustain life. Cell membranes control the 'molecular traffic' in and out of the cell and play an important role in controlling disease and nutritional balance in different parts of the body. The majority of Dr McLain's work uses the ISIS neutron source, the Science and Technology Facilities Council's world leading research centre at the Rutherford Appleton Laboratory in Oxford. "As an EPSRC Career Acceleration Fellow in Biochemistry at the University of Oxford, I am using neutron techniques to investigate biological problems such as protein folding and the formation of cellular membranes in solution. I am very honoured to win this prize as neutrons have played a fundamental role in my core research. It would not have been possible without the unique techniques and the support of the many excellent, experienced people I have collaborated with at ISIS," said Dr McLain on her achievement. 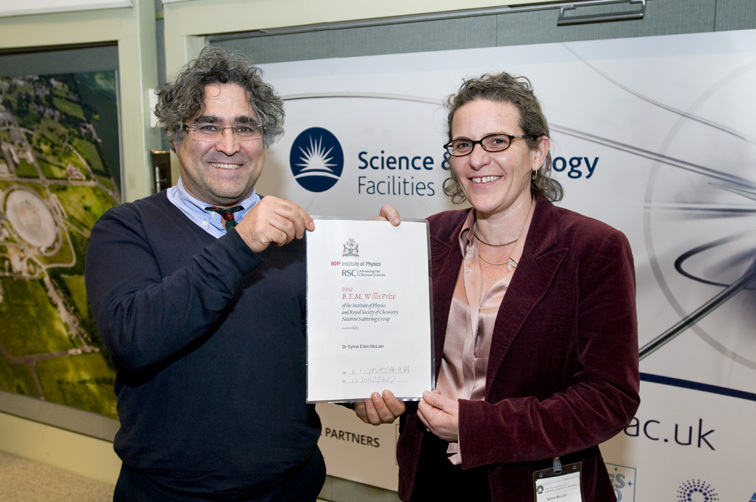 "We were impressed with Sylvia's research which is of wide interest and importance to academic research and several medical industries including pharmaceuticals," said Dr Ali Zarbakhsh, Chair of the IOP/RSC Neutron Scattering Group. "Sylvia has expanded the level of structural details we can obtain using neutron scattering techniques and advanced the complexity of the systems we can study". Dr McLain holds a 5-year £1.3 million EPSRC research grant at the Department of Biochemistry, University of Oxford. Her group uses a combination of neutron scattering, nuclear magnetic resonance and computer modelling techniques to discover how interactions at cell membranes take place. Understanding the structure of membranes is also needed to understand the regulation of cell activity. The results of the study will aid descriptions of many of the things that membranes do, such as signal transduction - which is important in passing messages between brain cells and the body via molecules called neurotransmitters, the passage of drugs into cells and the effect of external influences on cells from toxins and antimicrobial agents. The B.T.M Willis prize is sponsored by the Institute of Physics and the Royal Society of Chemistry. It is named after Dr Terry Willis, one of the pioneers of the use of neutron scattering in the United Kingdom. ISIS is a world-leading centre for research in physical and life sciences operated by the Science and Technology Facilities Council at the Rutherford Appleton Laboratory, Didcot, Oxfordshire, UK. ISIS produces beams of neutrons and muons that allow scientists to study materials at the atomic level using a suite of instruments, often described as a set of 'super-microscopes'. ISIS supports an international community of over 2000 scientists who use neutrons and muons for research in physics, chemistry, materials science, geology, engineering and biology. It is the most productive research centre of its type in the world. The IOP/RSC Neutron Scattering Group brings together scientists interested in the use of neutron scattering for the study of condensed matter. A principal function of the Group is to disseminate information about the neutron facilities available to as wide an audience as possible, particularly to newer entrants to the field and to those who work in related subjects but who may wish to make use of neutron scattering techniques from time to time. The Engineering and Physical Sciences Research Council (EPSRC) is the UK's main agency for funding research in engineering and physical sciences. EPSRC invests around £800m a year in research and postgraduate training, to help the nation handle the next generation of technological change. The areas covered range from information technology to structural engineering, and mathematics to materials science. This research forms the basis for future economic development in the UK and improvements for everyone's health, lifestyle and culture. EPSRC works alongside other Research Councils with responsibility for other areas of research. The Research Councils work collectively on issues of common concern via research Councils UK. ·         in the UK; ISIS pulsed neutron source, the Central Laser Facility, and LOFAR. STFC is also the majority shareholder in Diamond Light Source Ltd.
STFC is one of seven publicly-funded research councils. It is an independent, non-departmental public body of the Department for Business, Innovation and Skills (BIS).